And so it was that a few days ago, Jake (located in the United Kingdom) and I (located in the United States) recorded Episode #203 over a Skype call. Click on the image above to go to Episode #203 on The Voluntary Life website. Click here to go directly to the 35-minute interview. While I can't say that I have the best radio voice or that I'm the most eloquent of speakers, it sure was great fun talking with Jake. 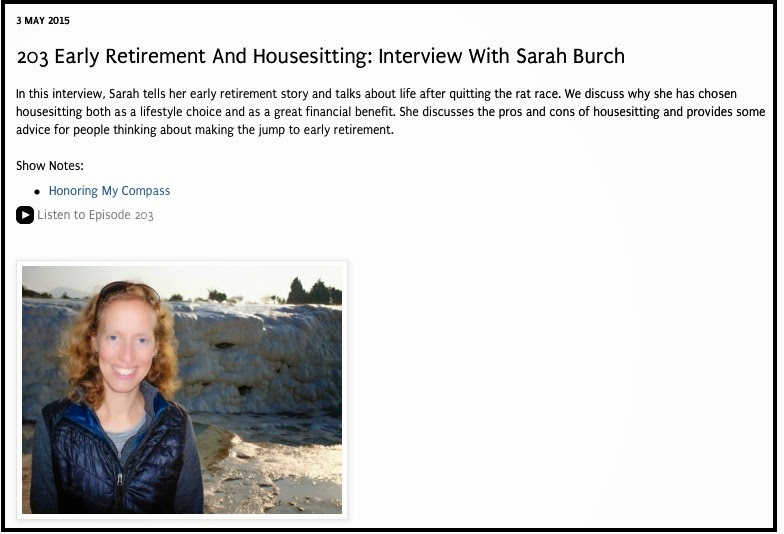 I hope the podcast episode will inspire others as they pursue their paths towards financial independence and freedom! Loved it! Thanks for sharing! I did learn a lot! Thanks for giving it a listen, Tony! it was fun. I learned new stuff about you, and what it took for you to be who you are! I have always been impressed with you, now I am even more so. Thanks for listening to the podcast, Beth, and thanks for reaching out with your excellent question! Ideally, it'd be great to schedule back-to-back housesits. Alas, housesitting opportunities don't always schedule themselves according to a housesitter's calendar. In previous years, I've stayed with friends, who have graciously opened their homes to me. However, I made a pact to myself this year that I would take better advantage of my "vacation time" between housesits. For example, I had a weekend-long break between housesits at the beginning of February, during which I went on an overnight bike trip. Likewise, I had a week between housesitting gigs at the beginning of April, and I took advantage of this time to do a backpacking trip to Hells Canyon. I intend of visiting some friends in other cities during upcoming breaks in my housesitting schedule. Although the stability of back-to-back housesits is preferable, I look forward to the challenge of how to best make use of the in-between time. I've been looking into FI more and more and I was wondering if there was a podcast out there. I told myself "checkout Sarah's blog, she'll probably know of one" and low and behold you have your own episode! Ha, yes! :) I'm glad you're considering FI. I can't think of a single reason why financial independence isn't absolutely marvelous. Let me know if I can help in any way!